The World Championship in Denmark and Germany held the focus of the men’s handball world in January. 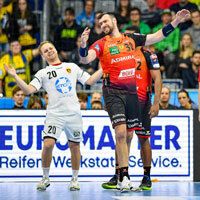 But now the VELUX EHF Champions League has returned and the race to Cologne continues. Sadly, this first round of the new year was missing some great players due to injuries that occurred over the break. After winning the World Championship as the head coach of Denmark, Nikolaj Jakobsen was unable to bring that confidence to his Rhein-Neckar Löwen players in the first game in the competition after the tournament. The Mannheim ‘Lions’ had a visit from HC Vardar in a crucial fight for second place, with the Macedonian side earning the two points after a three-goal win, 30:27. Vardar are in the best position to challenge Barça Lassa for the top spot in Group A, being three points behind with three games left to play. FC Barça Lassa were brought down to earth in Group A. After a winning streak of nine games, Telekom Veszprém HC spoiled Xavi Pascual’s 10th anniversary as Barça Lassa coach with a win at home, 29:26. It was only Pascual’s 42nd defeat in 559 matches in charge of the team. Barça still have a three-point lead at the top of the group and the nine-game winning streak was their second best in the history of the competition. But their record of 12 will not be beaten this season. Ljubomir Vranjes returned to the competition after leaving Veszprém in the fall. Now, he is head coach of IFK Kristianstad, where he replaced Ola Lindgren last month. Vranjes has his work cut out for him in the battle for the Last 16 with Kristianstad, who could have jumped to the crucial sixth place with a win on Saturday. But a narrow loss in Vranjes' first game – 33:34 against PGE Vive Kielce – leaves the Swedish team on the bottom of Group A. With three matches left to play in the group, the fight between Kristianstad, HC Meshkov Brest and Montpellier HB for sixth and the final ticket to the Last 16 will be tough. It is safe to say that it is harder to read which teams will qualify from Group B, as there are only four points between third place and last. MOL-Pick Szeged booked their ticket after a dramatic win in the Match of the Week against RK Celje Pivovarna Lasko, 29:28, where Jorge Maqueda scored the winning goal with seven seconds left on the clock. Szeged are now on 17 points in second place – seven points ahead of third place with six points left to play for. Szeged could not have secured one of the top two spots without the help of HC Motor Zaporozhye, who defeated SG Flensburg-Handewitt 28:26 on Sunday night. Flensburg, with four newly crowned world champions among their ranks, won the first-leg clash 31:24. Despite keeping the hosts to 10 goals in the first half of the return leg, the German team lost their edge after the break. Motor have built a strong home court and have secured seven of their nine points at home. The Ukrainians are now only one point behind third-placed Flensburg. There was no coincidence that Motor’s Igor Soroka scored the best goal of the round.